As promised, here’s a summary of the first chapter of Gary Taubes’ latest book Why We Get Fat: And What To Do About It. I’ll be going through it over the course of the next few posts, so stay tuned if you’d like to follow along. I highly recommend ordering the book yourself to see what all the well-deserved hype is about! These days, we are told that we get fat because we eat too much and don’t exercise enough–2 conditions resulting from our wealthy lifestyle in which food is plentiful and physical activity is no longer built into our work and play. Taubes challenges the assumption that taking in more calories than you burn is the driving force behind the obesity epidemic. Historically, obesity has been associated with poverty, not wealth. Taubes gives many examples of poor populations (the Pima indians, the Sioux, the Italians living in Naples in the 1950s, the Zulu and Bantu in Africa, and many more) who were impoverished and suffered from diabetes and obesity to the extent that us supposedly overfed, sedentary Americans do. Once the Pima and Sioux indians living on reservations switched over from their traditional diets of meat, fish, and crops to government rations consisting of white sugar and white flour, a large percentage of the people became overweight despite the hard physical labor they performed, and the symptoms of malnourishment they showed. In Trinidad in the 1960s, the islanders consumed less than 2,000 calories per day, yet 1/3 of the women older than 25 were obese. Why were these populations fat despite the fact that the people were physically active and consumed less than the recommended amount of calories? Gary Taubes sets out to explore this question in the subsequent chapters of the book. Chop unsweetened chocolate very finely. Heat coffee and half and half in a glass cup in the microwave for about 50 seconds, or until it starts to bubble. Add heated coffee mixture, sweeteners, chopped chocolate, and vanilla to blender. Blend mixture for one minute or until chocolate is melted. Add eggs and cream cheese, and blend. Taste, and adjust sweetener if necessary. Pour from blender into serving glasses, and chill in the refrigerator for 3-4 hours to set the mousse. Serve mousse topped with sugar-free sweetened heavy cream, if desired. Garnish with grated 70% chocolate, a sprig of mint, or a few raspberries. **If you’d like to make this recipe dairy-free and paleolithic diet friendly, replace the half and half with coconut milk, and replace the cream cheese with 2 Tablespoons of coconut milk and 2 Tablespoons of coconut oil. 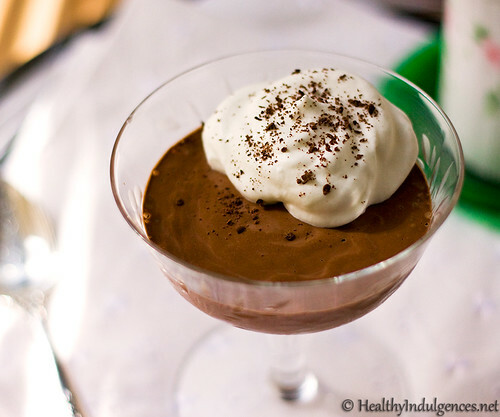 56 Comments on Healthier Decadent Chocolate Mousse – Sugar-Free and Incredibly Easy! woah.. as soon as this hurricane is finished, I am going to indulge in this! This looks really good! A couple of questions, though. We have Truvia in packets. Do you know how many packets it takes to make a tablespoon? Also, why is the Truvia combined with Splenda? Thanks! Is there any particular reason to not swap heavy whipping cream for the half-n-half? If you were to do that wouldn't that drop the carbs even further — effectively leaving the carbs coming from the unsweetened chocolate and cream cheese? Just curious! Sounds yummy! I don't really care for coffee, but when combined with chocolate I love it! May have to try it. I really want to make this, but I need a substitute for the coffee… ? Wow, what a great way to sneak raw (pastured preferably) eggs into your diet! looks great!!! I always love your blog. I will post this on my Facebook blog page! Rachel: Have you tried Teeccino? I would think that would work just as well. MK – Macaroons sound great too! I'll have to get to work on those. ;)Let me know how the mousse works out for you! Renie – Stay safe! Hope you get the chance to try it. Brian – There is 3/4 of a teaspoon of Truvia in each packet according to Linda Sue's low carb website. 4 packets = 1 Tablespoon. Hope that helps! The Truvia is combined with the Splenda so there's no aftertaste from the Truvia. I find that Truvia has a tingly, burning mouthfeel when you use too much in a recipe that contains a lot of fat. It's a side effect from the erythritol that Truvia is made from. I'm trying to create versions of recipes with ingredients available from the grocery store now. 🙂 As far as I can tell, Splenda has been proven safe in many studies that have been performed on it. Trying to give people options. Hope that helps! Rick F – I subbed the half and half for some of the coffee in the original recipe. I find that the milk in it tones down the harshness from that bitter unsweetened chocolate (and saves a few calories!). Let me know if you do try it with cream, though. Rachel – Like Brian said, Teeccino or another coffee substitute would be great in this. I don't see why water wouldn't work just as well since it doesn't do anything for the consistency, really. A chocolate or vanilla flavored tea (Sugar Cookie by Celestial Seasonings – mm!) or unsweetened fruit juice would be great in this as well. Rachel – Thank you for stopping by! Love your blog. Brian – Thank you for suggesting that helpful alternative. I'll have to get my coffee substitute down off the shelf and whip up a version this morning! Hi, Lauren, I feel silly asking you this but since Iam from South Africa and am not one that bakes often, what does it mean by when you say 1/4 Cup half and half? I will try it with water (sweetened with chocolate stevia or capella drops!) Thanks! I just made this and waiting 3 hours for it to set is killing me! I usually make something because I need chocolate NOW! I'm sure it will be worth it! I don't use splenda or any sweetener ending with tol, so, being out of honey and agave, I used maple syrup. The taste was amazing before I put in fridge, we'll see if it sets up like it's supposed to! Thanks for sharing! Thanks, Lauren. One more question. How could I make this without any chocolate? Our son is sensitive to chocolate, and I'd like to make something he could eat, too. Carob would be one option, or even vanilla would be good. Thanks! Here are some great Chocolate Truffles! I just ready Taubes book a few months ago. Every single american should read that book! It's so good. And important! Would hot cocoa be an okay substitute for the coffee? Coffee makes me gag and I can taste it no matter how little of it is in a recipe (I was so disappointed to finally try tiramisu, yuck!). loved your chapter summary! you're one informed lady! keep up the excellent work, girl! Lauren, that looks delicious! And it's pretty enough for company, that's a hard one sometimes. Stewed fruit is kind of well- gloppy, if tasty. My goodness, Miss L.. this stuff is fabulous! My question is about um.. portion control and, also, the desire to give some to my LC'ing daughter.. who might also encounter the portion control issue! Google has lots of pots de creme recipes that say freezing is ok. Most of those seem to be baked. So, wondering if you know if this recipe would lend itself to freezing in portions? Dang girl, I loved it! 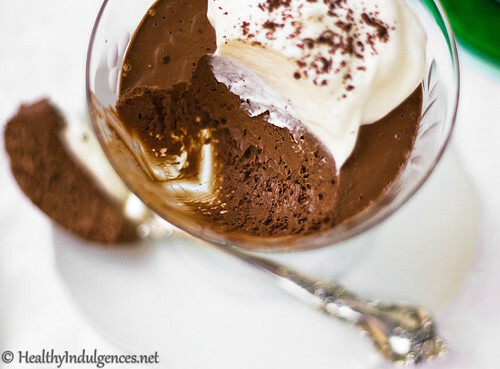 Thanks Lauren for including my chocolate mouse recipe, too! I LOVE The Pioneer Woman. I remember seeing that post and thinking it could be made low carb. Thanks for doing it for us! OMG, so good! But I never expect anything less from your recipes. I had a tough time waiting the 3-4 hours, so I stuck it in the freezer for an hour (after it was in the fridge for an hour prior). Came out so yummy. Gelled/froze up a bit (like ice cream), but after it thawed was still too liquidy but I slurped it down anyway (but I also used 1 T cocoa powder and only 1 square of unsweetened chocolate since that's what I had). Oh man! Double this recipe! Loved this recipe. The paleo version is great and I needed to use up some coconut milk so it worked out well! I tried this with the kids, substituting cocoa powder for coffee. We all loved it. Easy, messy, delicious! I made this mousse this afternoon and put it in the fridge a couple hours ago. I just snuck a little taste to see what I thought. It is SO GOOD!!!!! I sweetened with a mix of erythritol, xylitol, and stevia. I actually ended up putting in 2 drops of liquid splenda after it was blended because I thought it could use a little more sweetening. I'm going to top it with whipped cream. It's really rich and super tasty. I'm thinking this could be really good in an almond or hazelnut crust of some sort. Thanks for the recipe!! Just scrolling through this and some other recipes, I am looking forward to giving this a try. One question regarding the ingredient Splenda. I appologise if this is a subjec you have alrady address elsewhere but I have heard of and ready many articles that claim this product is not all it is cracked up to be, that is is actually just as toxic as some of there other artificial sweeteners like aspartame. Just wondering if you have any thoughts on the subject. It's so rich, I couldn't believe that is low in carb. I'll give a try, and finish it with a velvety blueberry on top. So it's 1/4 cup of brewed coffee? If I use a shot of espresso (1oz), maybe I'll need to add some water, what do you think? Oh my..looks so delicious!Can i do this without coffee?? I really dont like it but the chocolate is my favourite! I will have to try that recipe. I'm trying to mostly stay away from chocolate, but this is the next best thing since it's sugar free. Thanks! hi guys!can u use caster suger instead of substitute? also can i ask what half and half is? Its really mouthwatering. And its guaranteed diabetic friendly. Hey Lauren – I wanted to see if you had any LC holiday cookie recipes. I am planning on doing a round up on my blog next week and would love to link to some of my fav LC authors. I got over 90K views on my blog last month and want to "share the wealth" so to speak. If you want to be included, email me at carketch29 (at) yahoo (dot) com. Carly, we're trying to avoid sugar here. Using caster sugar would add calories, carbs, and make it no longer "healthy" or "sugar-free"! Also, "Half and Half" is a common dairy product here in the US that is half cream and half milk. You could probably substitute a light cream. Rachel, you could use organic coffee flavoring or any flavoring of your choice. has anyone tried it with agave? i am wondering how much to use. no stevia etc please. thanks so much! Hi Maryann, I haven't tried agave due to the fructose content, but I'm not sure if it would allow the mousse to set properly. Hopefully someone else can chime in and help you with your question! Hi Lauren, perhaps I shall have to be the guinea pig with the agave. Will let all know the results although it looks as if it will not be anytime soon as have consumed too much of everything in the past few holiday weeks. Sounds like a decadent Valentines day dessert though so will try it out before then and post results! Hi! I really want to make this, but I'm hesitant because the recipe uses raw eggs? Isn't it unsafe to just eat raw eggs? Is there some sort of substitue for that? Could I use Agave nectar as the sweeter in the mousse recipe, and if so how much. thank you. Anon – I mean 1/4 cup brewed coffee. Thank you for catching that! Kristin – If you have stevia I would use 10 teaspoons since agave is close to honey in terms of sweetness. If you don't have stevia, try adding 2 more teaspoons. Using coconut oil variation if you are using agave. Let me know how it turns out for you! This was heavenly, orgasmic, crazy delicious!!! I had to translate this to norwegian and post it on my blog (at: http://skinnyshepherd.blogspot.no/2012/08/sjokolademousse.html), but i have linked to your blog and told everyone that i found on your page… 🙂 Hope it's ok. I used irish mocca coffe (has a hint of whiskey and vanilla) instead of regular coffe. And i used 3 tablespoons of sukrin + (sukrin with stevia). I am so happy you enjoyed the mousse! You blogged about it in Norwegian?! Awesome. Thanks for giving me credit! The irish mocca coffee in the mousse sounds amazing. Thank you for sharing your twist on the recipe, Skinnyshepherd!